Given by the Watcombe Terracotta Clay Co. Ltd. 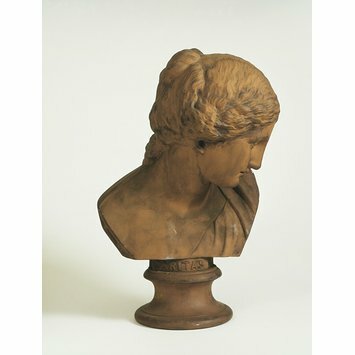 This terracotta (baked clay) bust is not one of the known busts made for sale by Watcombe at Torquay, Devon, in south-west England, and may therefore have been a trial piece. It is based on a much admired marble statue of St Susanna in the church of S. Maria di Loreto, Rome, carved in the late 1620s by François Du Quesnoy. Stamped on the band beneath this bust is 'CARITAS' (Charity). François Duquesnoy (c. 1594-1643) was a Netherlandish sculptor who spent most of working life in Rome and assimilated the classical style. His tender and sensuous reliefs of cupids, satyrs and small children were highly influential. Watcombe Terra-cotta Clay Company Ltd. was founded in 1869 (and continued business until 1883) by George Allen at St Mary's Church, Torquay, Devon. It capitalised on the rich deposits of red clay found whilst builders were excavating the foundations for Watcombe House. Christopher Dresser has been linked with the firm, for its products show similarities to Dresser's designs and sometimes carry ornament derived from his published works. The south Devon pottery industry grew rapidly during the latter part of the nineteenth century following the discovery of fine terra cotta clay at Watcombe in 1865. Charity (lat. Caritas), literally means 'love', love in the sense of lovingness and kindness towards all others and is the foremost of the virtues. Charity is often represented with a flame, often coming out of some kind of vase, or she holds a candle. Often she is suckling to infants, or she is surrounded by three to four infants, one usually at the breast. 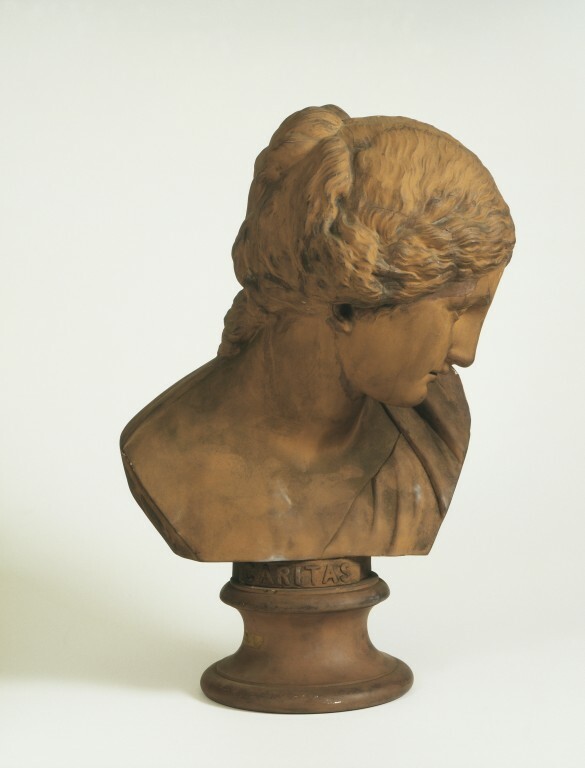 Bust, red earthenware, with head inclined to the left. Drapery over left shoulder. Mark 'Watcombe Torquay' impressed. Number on '27' in gold leaf on socle. Remnants of a label inscribed. Stamped. Given by the Watcombe Terracotta Clay Company in 1901.